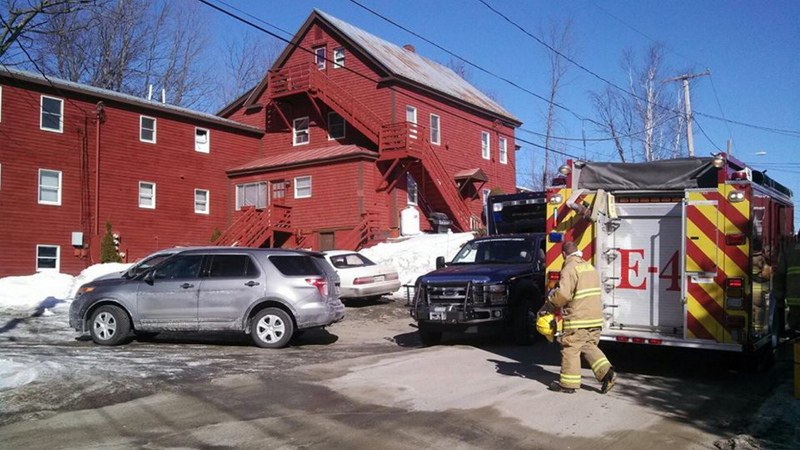 Authorities cite Oakland home, Waterville Fireside Inn and a Skowhegan car as being connected with a manufacturing operation. Fanning across Waterville and Oakland Friday morning, scores of state drug agents and police arrested six people and seized evidence in connection with a large manufacturing operation of the drug methamphetamine. Officials centered much of their attention on a motel wing of Waterville Fireside Inn & Suites, where police say meth was being produced. Arrested were five Oakland residents — Christopher McEachern, 27; Corey Stevens, 22; James Bell, 43; Katherine Tibbetts, 48; and Rachel Wolfe, 26 — and a man from Linneus in Aroostook County, Eric “Joe” Finnemore, 35. Police have been investigating methamphetamine manufacturing and sale in the Waterville and Oakland area for about a month, according to Maine Department of Public Safety spokesman Steve McCausland. Agents found evidence that Finnemore, charged with class B trafficking and manufacturing of methamphetamine, was the central figure of a local group that was manufacturing and selling meth in the area, according to police. Agents also found that members of the group were buying antihistamine drugs containing pseudoephedrine, a necessary ingredient in the production, and several agents went undercover and bought drugs from the group, authorities said. Meanwhile, Gov. Paul LePage issued a statement commending the drug bust and pointing to his proposed legislation — first unveiled at his State of the State address last month — to expand Maine’s drug enforcement by adding four special drug prosecutors, four judges and 14 agents to the Maine Drug Enforcement Agency. LePage’s press secretary, Adrienne Bennett, said following Friday’s arrests that LePage also decided to add an additional $40,000 into the $2.7 million proposed bill to help pay for the protective suits that drug agents wear when dismantling a meth lab. The suits can cost $2,000 and need to be frequently discarded and replaced. Before the arrests, two search warrants were served at 11 Center St., in Oakland, and the other at a room at the Waterville Fireside Inn & Suites on Main Street. 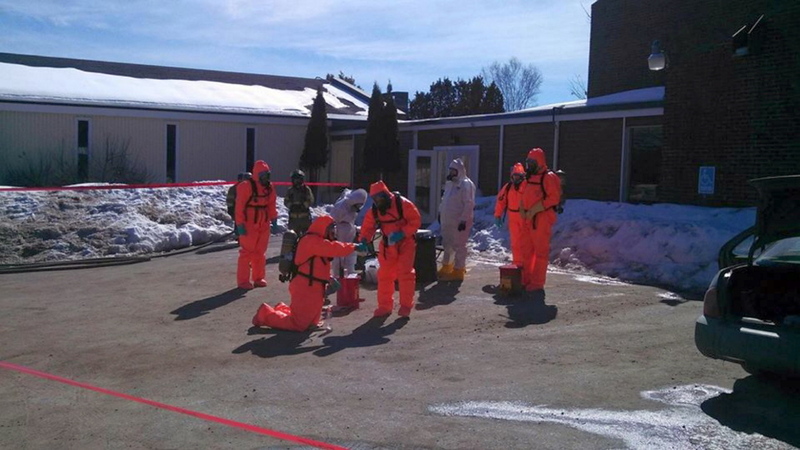 A wing of the motel was evacuated by the Maine Drug Enforcement Agency Clandestine Laboratory Enforcement Team after evidence of meth manufacturing was found in a motel room. The manufacturing process involves highly flammable and explosive material, police noted. 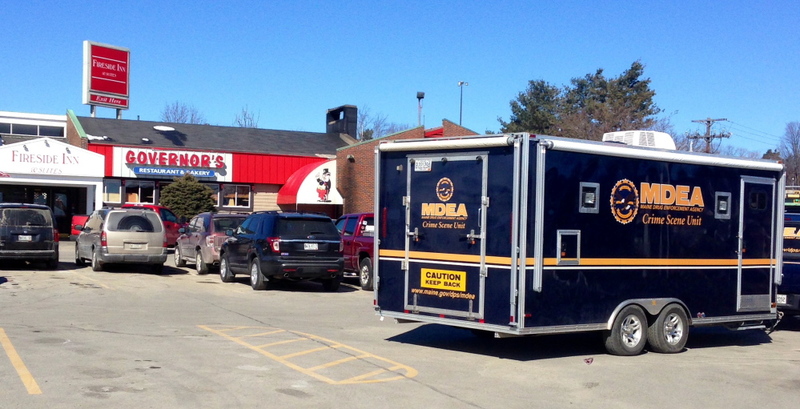 The team members, wearing protective suits, searched the room at the motel and at the Oakland location. In addition, investigators seized a vehicle in Skowhegan, though did not offer details about who it belongs to. The arrests were key to Oakland because they dismantled the manufacturing operation of a drug that has been only recently gaining ground in the community, said Sgt. Peter Tibbetts of the Oakland Police Department. He said they were using one-pot manufacturing, meaning a single container is used to produce meth — such as a large juice bottle — making the drug lab portable. Meth is produced through a process of chemical mixing and cooking. At the 11 Center St. apartment building in Oakland that police and federal agents raided, tenants were outside Friday afternoon talking about the meth operation. Cody Pooler, 24, said he was in his apartment around 9:30 a.m. when police converged on the building, searching the apartment above his, as well as an adjacent apartment. Pooler said he had no idea his neighbors were involved in a meth operation. “I’m glad it’s gone now because if they’re making a meth lab in a house, I’m glad it didn’t blow up,” he said. Pooler and his roommate, Bryan Reed, also 24, were standing in the driveway of the large red apartment building, when Tammy Wolfe — Rachel Wolfe’s mother — came out the building, saying she had arrived home to find her apartment torn apart. She lives with her daughter, as well as McEachern, according to Pooler. Then, with hands shaking, she started yelling and crying, accusing Pooler of “ratting” on those who were arrested, and stealing an X-box. Pooler denied being a police informant and stealing an X-box and said he had no knowledge that his neighbors were involved in a meth operation. Tammy Wolfe said her mother was going to pick her up, and shortly thereafter, a woman drove up and Wolfe left with her. Reed said he learned of the raid when Pooler woke him up, saying police were all around the apartment building. Reed said a little girl lived in one of the apartments that had been searched, and police gave her to a family member. Reed said the raid lasted more than an hour. While he did not have any idea his neighbors might involved with producing meth, he did notice a lot of people coming and going at all hours of the day and night, he said. As Pooler and Reed stood in the parking lot, people drove up in cars and stopped to talk about the raid. Other neighbors said they thought police had been watching the apartment building for a few weeks before they raided it Friday morning. The apartment building where the raid occurred is owned by Brown House Properties, a family business. Lindsey Booker Burrill, one of the owners, said she and her family were aware police had been working on a case involving people in the building, but she did not know exactly what the case entailed. “I actually just found out from one of my tenants what was going on,” she said at 3 p.m. Friday. Booker Burrill said she and her family are grateful law enforcement officials took care of the situation. 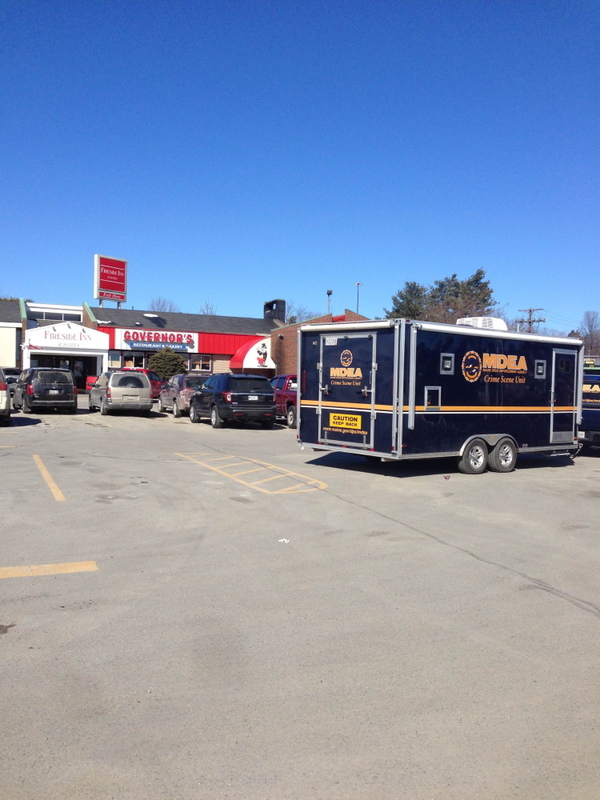 Agents expected to be at the scenes in Oakland and Waterville most of Friday afternoon collecting evidence. Those arrested were taken to the Kennebec County jail. The Maine Drug Enforcement Agency is being assisted by the Waterville police and fire departments, Oakland police and fire departments, the Kennebec County Sheriff’s Department, the U.S. Drug Enforcement Administration, the Maine Department of Environmental Protection, the Skowhegan Police Department and chemists from Maine Health and Environmental Testing Laboratory. Tibbetts said the police department was already familiar with all of the Oakland residents arrested. Morning Sentinel records show McEachern was sentenced to seven months in jail for robbing a pizza delivery man in 2010. LePage wrote in his statement Friday that there were 163 drug deaths in Maine in 2012 and 20 percent of the homicides in 2012 were related to illegal drugs. He said the number of deaths shows the urgency of addressing problems with drug use and trafficking. Bennett said LePage hopes Democratic legislators schedule to bring the drug bill to the floor in a timely manner because of the problems drugs pose in communities.